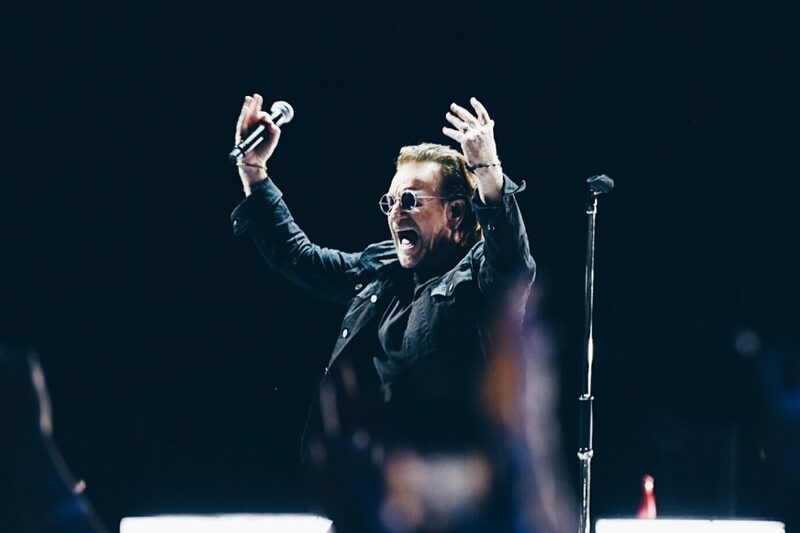 U2 kick Dublin 3Arena run off with a stunner! The first communal cheer of the night erupts as Michael D. and Sabina Higgins take their seats in Block B. As an out of retirement MacPhisto remarks later - it's sort of good to have the horny ole devil back - "Fee-fi-fo-fum, I smell the blood of a two-term Limerick man!" This is much more of a Miggedly gig than a Peter Casey one. There obviously wasn't time to add the latter to the rogue's gallery - Trump, Kim Jong Un, Bashar al-Assad, Robert Mugabe and Vladimir Putin among them - that graces the extremely large LED screen before Charlie Chaplin’s final speech from The Great Dictator tees up 'The Blackout', an opening song that with its "Democracy is flat on its back" refrain is tailor-made for the despotic times we live in. "We're a band from the Northside formerly known as The Hype," Bono proclaims as U2 rock 'n' roll the years back with versions of 'I Will Follow' and 'Gloria' that have changed little since they were blasted out in the Baggot, which is among several old haunts name-checked over the course of an unapologetically sentimental and nostalgic show. They may have been forced to abandon it recently in Berlin when Mr. H's voice gave out, but tonight 'Beautiful Day' swoops, soars and generally confirms that normal note-hitting service has been resumed. He's also in inspired form as The Edge joins him on the runway for 'The Fly', which together with 'Zoo Station', 'Even Better Than The Real Thing', 'Who's Gonna Ride Your Wild Horses', 'Acrobat', and the obligatory encore version of 'One' recalls the time U2 spent standing (and recording) by the wall in Hansa Studios during the early '90s. Lest anyone fails to get the pro-European solidarity message, the blue flag with the yellow stars that so enrages Johnson, Farage, Rees Mogg, Duncan Smith et al. is digitally unfurled towards the end of the show. U2's continued ability to shock and awe is underlined by the double punk whammy of 'Elevation' and 'Vertigo', which manages to sneak in a couple of bars of 'Rebel Rebel'. The last time U2 played the North Wall they were overwhelmed by the technology. Tonight, it's used much more sparingly as the band spend most of the set within physical touching distance of each other. If they decide to strip it down even further, there will be no complaints from me or, I suspect, the majority of the 3Arena audience who are stunned into silence by a bare bones 'Summer Of Love' that finds Edge indulging in some dexterous Spanish guitar picking. Accompanied by footage of a migrant boat listing dangerously just a few hundred metres away from a luxury cruise liner, and those 'very fine people' that Trump refused to condemn in Charlottesville, it's a real highlight. It's an old song, though, that packs the biggest emotional punch tonight. Having moved down from the balcony to the floor, I can't see what Michael D. and Sabina's reaction is, but all around me there's communal singing and hugging as 'Pride (In The Name Of Love)' reminds us that there's a new civil rights war to be fought.